The European Union and Global Ocean Governance - Jan-Stefan Fritz, German Marine Research Consortium, Brussels, Belgium (Wed. 3rd Oct.) Public lecture. Two-day workshop on Transparency and the Pharmaceutical Industry in Comparative Perspective held by the Jean Monnet Health and Policy Network at Dalhousie (3rd - 4th July). See: jmhealthnet.orgfor more information on this major three-year project. Two-day workshop on Transparency and the Pharmaceutical Industry in comparative Perspective held by the Jean Monnet Health and Policy Network at Dalhousie (3rd - 4th July). See: jmhealthnet.org for more information on this major three-year project. Public Panel on Innovation in Housing Models and Policies for Older LGBTQi2S Populations: Lessons from the European Union - 29th June at Halifax Central Library, Spring Garden Road. This event was part of a two-day workshop organised by the JMEUCE in collaboration with the MacEachen Institute, Dalhousie University's Healthy Populations Institute, Faculty of Health and Faculty of Arts and Social Sciences, and the Halifax Public Libraries. Public workshop on CETA Implementation: the Next Steps - 18th May. Potter Auditorium, Rowe Building, Dalhousie University. See ciipdal.ca for workshop programme and other details or e-mail ciip@dal.ca. EU Study Tour (13th May - 2nd June) & Internship Programme - The JMEUCE sponsored three students to participate in the 2018 programme -- "an excellent study opportunity -- less a "course" than an immersion in European institutions, a program for self-directed and independent study". See: www.uvic.ca/interdisciplinary/europe/study-tour/index.php or contact jmeuce@dal.ca for details. Europe Day was celebrated on 9th May. Day of Debate: The JMEUCE hosted nearly 40 local IB and pre-IB students at Dalhousie to debate current EU issues - 11th April 2018. 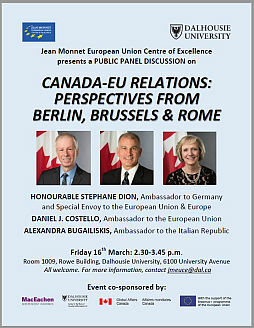 Canada-EU Relations: Perspectives from Berlin, Brussels & Rome - public panel discussion with Ambassador Stephane Dion, Ambassador Daniel Costello, Ambassador Alexandra Bugailiskis. Organised by JMEUCE and co-sponsored by the MacEachen Institute for Public Policy and Governance and the Centre for the Study of Security and Development. 16th March. Watch the video recording. Still Europe's Underbelly? A Roundtable on Italy's Upcoming Elections, presented by the JMEUCE and Dalhousie's Italian Studies Program. 1st March. Workshop on CETA Implementation: The Next Steps to be held at Dalhousie University, 18th May 2018. CALL FOR PAPERS - abstracts due by 15th March. Contact the CETA Implementation and Implications Project (ciip@dal.ca) for details including possible funding support. H.E. Peteris Ustubs, EU Ambassador to Canada -- public talk on: The European Union as a Strategic Partner - 16th Nov. 2017. See Dal News article about this event: https://www.dal.ca/news/2017/12/14/eu-ambassador-visits-dal-to-discuss-strategic-partnership-with-c.html?utm_source=dalnewsRSS&utm_medium=RSS&utm_campaign=dalnews. Roundtable - Catalonia's Quest for Independence: Another European Crisis? (Wed. 11th Oct.: 2.30-4.00), with speakers Dr Jerry White, Canada Research Chair in European Studies, Dalhousie University and Dr Ruben Zaiotti, Director, Jean Monnet European Union Centre of Excellence, Dalhousie University. Brexit Panel: What’s Next? Implications for Law & Life (20th September) in collaboration with the Schulich School of Law. in collaboration with the Schulich School of Law. Panel: Ruben Zaiotti (moderator), Vincent Power, Francesco Munari, Teresa Cyrus. See: panel poster for details. International Summer Institute on Migration and Identity (30th June-14th July 2017) in partnership with Dalhousie University's Centre for European Studies and Canadian Studies Program, as well as Pier 21. Models of institutionalised (dis-)integration? What next for the EU-US, CETA & Brexit? Elaine Fahey. Speaker Series - 24th March 2017. EU Study Tour (7th-27th May 2017) & Internship Programme with two students representing Dalhousie with JMEUCE support.